Who Builds the Talent Pool? Orientation for our next Hiring Talent online program starts next Monday. For more information or pre-registration, follow this link Hiring Talent – 2013. Byron was a bit unsettled. “Do you mean that I should read those resumes? I’m not the hiring manager,” he stated flatly. “But, I am not the hiring manager,” he continued to protest. “No, you are the manager-once-removed. Are you threatened by this hire?” I asked. Just released on Kindle. 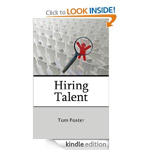 The only book on hiring that blends the research on levels of work with the discipline of behavioral interviewing. The research on levels of work, pioneered by the late Elliott Jaques, is powerful science. The discipline of behavioral interviewing is the most effective method for its application. 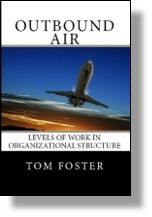 This is the only book that puts these two ideas together in a practical framework for managers faced with the hiring decision. This entry was posted in Uncategorized and tagged hiring manager, hiring talent, manager once removed on March 1, 2013 by Tom Foster.